On a politically charged night, the ads that received the most attention didn't necessarily receive the most love. Super Bowl LI, in which the Atlanta Falcons fell to the New England Patriots in the big game's first-ever overtime, made for an extraordinary night of football. An extended game also meant that fans spent more time watching and discussing the commercials online. iSpot.TV analyzed all 129 Super Bowl commercials for the total amount of online views they received on YouTube, Facebook and iSpot.tv. Here are the results. 1. 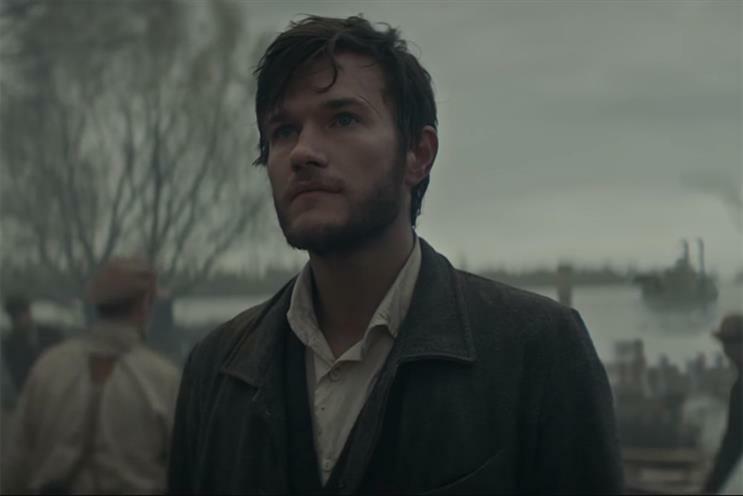 Budweiser "Born the Hard Way"
Created by Anomaly New York, Budweiser’s 60-second spot tells the story of Adolphus Busch, co-founder of Budweiser’s parent company Anheuser-Busch, on his immigration to America from Germany in 1857. The estimated spend on the ad was $9.8 million, according to iSpot.tv. Although the ad generated the most views, the spot drew some of the harshest reactions of the night. The sentiment around the ad was only 57 percent positive, with many viewers complaining it was too political. Even before the game, angry customers had taken to Twitter with the hashtag #BoycottBudweiser. 2. Hulu "The Handmaid’s Tale: My Name is Offred"
This pre-released 30-second ad promotes "The Handmaid’s Tale," a Hulu original series coming to the platform in April. It’s a story adapted from the novel of the same name written by Margaret Atwood. The ad saw a 94 percent positive sentiment rating. iSpot.tv estimates Hulu’s ad spend to be $10.5 million. 3. Mr. Clean "Cleaner of Your Dreams"
After the Budweiser and Hulu ads, the metrics take a deep plunge. While Budweiser and Hulu both earned over 7 million views for their ads, Mr. Clean comes in at third place with just 3.7 million views. In Procter & Gamble's 30-second spot, made by Leo Burnett Canada, the brand’s musky mascot takes on a sexier vibe as he scrubs the floors. "Cleaner of Your Dreams" was one of the most liked ads of the night, with a 99 percent positive sentiment rating. The ad spend is estimated to be around $5.3 million. Wix.com made an action-packed ad for its website creation product starring Jason Statham ("The Transporter," "Crank") and Gal Gadot ("Batman v. Superman," "Fast & Furious 6") for this year’s Super Bowl. The ad received an 85 percent positive sentiment rating and is determined to have cost $5.3 million. 5. Bud Light "Ghost Spuds"
The beer brand brought a decreased pet back to life in this year’s Super Bowl spot. The dog Spuds MacKenzie first debuted in Bud Light’s 1987 Super Bowl commercial. The comedic spot, from Wieden+Kennedy New York, received an 82 percent positive sentiment rating, and is estimated to have cost $14.7 million, the most expensive ad in the top 10. 5. Universal Pictures "The Fate of the Furious"
Universal Pictures’ Super Bowl spot promoted "The Fate of the Furious," the eighth movie in the never-ending Fast and Furious franchise. The movie premiers this April. The 60-second spot saw a 98 percent approval rating and is estimated to have cost $10.5 million. T-Mobile had four spots in this year’s Super Bowl, one of which featured Martha Stewart and Snoop Dogg. However, the ad that saw the most views online during the game was the only spot the mobile carrier pre-released. In the 60-second spot, courtesy of Publicis Seattle, Justin Bieber shows off his own touchdown dance moves and says he will retweet other’s "unlimited moves." The sentiment around the spot was 88 percent positive and is evaluated to have cost $10 million. 8. Paramount Pictures "Transformers: The Last Knight"
Paramount Pictures is the second movie studio to make iSpot.tv’s list of the most-viewed Super Bowl ads on game day. Its trailer for "Transformers: The Last Knight," which premieres in June, saw a 98 percent positive sentiment and is estimated to have cost $5.2 million. Melissa McCarthy ("Ghostbusters," "Bridesmaids") stars in Kia’s 60-second Super Bowl spot from David & Goliath, in which she gets pummeled by a whale, cut down from a tree and chased by a rhino. The sentiment around the ad was 99 percent positive, equal to Mr.Clean’s spot. Kia’s ad is valued at $10.4 million. Honda’s Super Bowl spot cleverly inserted the voices of celebrities such as Tina Fey, Steve Carell and Stan Lee into their old yearbook photos to deliver inspirational messages about achieving your dreams. The sentiment around the 60-second commercial, from creative agency RPA, was 99 percent positive and is estimated to have cost $10.4 million.